Born in Denver where he grew up a fan of the Broncos, K. C. and his family moved to Midland, Texas when he was 8 years old. As a captain for the storied Robert E. Lee Rebels, he was named the team MVP his senior season and a 1991 Texas All-State selection. After a redshirt year, he became one of the youngest centers in U.M. history, starting all 12 games at age 19. As a Sophomore, he was voted a unanimous First Team All-Big East selection by the conference's coaches. In 1995, he was voted All-Big East again, even though he missed six games due to a knee injury. As a Senior in 1996, K. C. was widely considered one of the nation's top centers, and the post season awards took notice. He was named First Team All-American by the Associated Press, and selected to his third straight All-Big East honors. 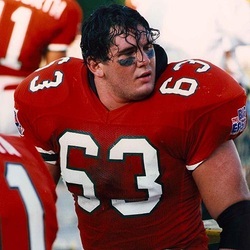 He was a semifinalist for both the Outland Trophy, given to the nation's best interior lineman, and the Lombardi Trophy, to the top offensive or defensive lineman. Considered by his coaches as one of the top lineman ever at Miami, he used his size for great leverage and knew how to finish a block, equally dominating in run or pass protection. One of the quickest offensive lineman, his speed allowed him to block down field after pass receptions, his biggest assets may have been his commitment, pride and work ethic. A fierce intense competitor, he once ripped the facemask off the helmet of a defensive teammate in practice. He was signed as a free agent by his hometown Denver Broncos and spent 5 seasons with the team, including the Broncos' Super Bowl XXXIII and XXXIV Championship teams. KC served as President of the UM Sports Hall of Fame from 2013 to 2015.